I have several December birthday cards to make, and here is the first. I love the Tim Holtz Festive Stencil, and decided to ink it up for one of the Birthday cards I need this month. I used Simon Says inks in Green Leaf, Dark Chocolate, and Schoolhouse Red; and, a touch of Pine Needles Distress ink to color the stencil image. I added some Darice sequins and Lawn Fawn twine to finish the card. The last two Christmas cards for this year. Many of you might recall I am a Night Owl, mostly because my body still thinks it is living in the Pacific Time Zone, and it is not about to change. One morning I woke up and had an idea for a card...it was about 4:30 am less than an hour after I went to sleep. So I wrote it down and made a hasty sketch I knew I couldn't make the card right then, I was tired. This was months ago, and I finally took some time to make the card. The first card has varying shades of white with silver accents, the second card has a shiny barely cream colored card base along with the white and silver. Card bases are from DCWV, as are the diecuts. There is a silver snowflake gem from Stampin up and two Simon Says Stamp Snowflake die cuts - Kate and Maryanne. The frame was cut out with MFT pierced rectangles, and the tree line is from Impression Obsession. The Noel sentiment is from AMuse, and was cut from white card, then inked with Hero Arts Silver ink. I made two cards, as I thought the first needed more depth. I love white on white, but the second card just seems a bit more festive to me. What do you think? Stamps from Hero Arts, Stampin Up; dies from Lawn Fawn, My Favorite Things, Sizzix; Embossing powders from Hero Arts; Gems from Stampin Up; Stencil from Simon Says Stamp. A simple card. I used Darice's Ornaments on Side embossing folder and used a versamark pen to add gold embossing powder to selected portions of the dry embossed shapes. I finished the card with a beautifully simple Merry Christmas sentiment from Simon Says Stamp's set Be Joyful. Every now and then, I can make a clean and simple card without freaking from all the white space! I haven't played at Mojo Monday for a while, I always save the challenge, but then the week is gone before I get to making a card. This week I made a point of playing. I really liked the sketch provided. I got out a new stencil that I have had for a bit, but haven't dirtied up at all. I started with Hero Arts silver ink. After it dried I adjusted the Zig Zag Dot Stencil from SSS to the uninked spaces and filled them with embossing paste and Distress Glitter in rock candy. I then set the panel aside to dry. Next I pulled out several dies, the heart from Lawn Fawn's Stitched Party Banners, the small Love from SSS, and pierced rectangles from MFT. I cut a matching heart out of the left over of the strip I cut for the side using the same patterned side. I cut the love 3 times from the back side of the patterned paper, and then I cut my center panel from the embossed and inked piece. Everything was glued in place with the sketch layout in mind. I have always had a soft spot for Hero Arts' adorable little reindeer (H5457). As I was looking through my embossing folders I came across one from Provo Craft that had similar curly bits that reminded me of the reindeer. I thought they would make a nice card together. I dry embossed the Tiffany folder onto a discarded 1/2 card base from DCWV. I heat embossed the reindeer in the middle and added a heat embossed AMuse sentiment from the Say it with Style set. I couldn't resist punching out a small circle from a large piece of sequins for his nose. I have been making so many Christmas cards, that it was fun to get out of that mode and try my hand at my first Valentine for 2015. Wow where has this year gone? I have 3 or 4 Mama Elephant stamp sets none of which are Valentine themed; so I needed to be creative. I decided to use Waterblooms and a mask to create my card. I cut a heart from a folded piece of copy paper and taped the negative portion onto my white card panel. Then I grabbed some inkpads - Simon Says Stamp in Green Leaf, Blue Violet, and Lipstick Red. I also grabbed Hero Arts inkpads in Neon Pink, Passion Flower, Pale Tomato and Silver. I pulled a few of the stamps from the ME set, and began stamping. I started with the leaves, then the bigger flowers. The dots were added at the end in neon pink and silver to fill gaps. Then I masked off the heart with the center piece I had cut earlier and added some Heidi Swapp Color Shine in Primrose. I have to admit I love splatters, but wow the card was way too bright. Vellum saves the card front, I heat embossed in white a Craft Smart Valentine sentiment onto the vellum and wrapped it around the card front. Then it was too muted! So I glued down parts of the vellum over the stamped flower images. This allowed more of the images to show through the vellum. I added small moonshine sequins from SSS to cover up the glued places. I added some red to frame the sides of the card. Tired of making holiday cards? Give this challenge a try, its open until December 29th! Greetings...my Saturday marathon of cardmaking started with the Bi-Weekly Hero Arts Flickr group scramble. Natalie was our hostess, and she asked us to use some of our oldest Hero Arts holiday stamps to make a card. I picked out two stamps that I purchased when I first became interested in cardmaking, CG230 Happy Holiday Trees and CG472 Snowflakes N Ornaments. Both of these cards were stamped and heat embossed, one of my favorite techniques. A bit of ribbon, twine and some bling...and they were done. After completing some chores and making dinner, I again sat down to see if I could make a couple more cards. I still had the Happy Holiday Tree Stamp out, so I thought about what I could do differently. This is such a fantastic stamp. Stamping the image shows snow topped branches, and when you clear emboss it and use a resist technique it still shows snowy branches - Genius stamp. I decided to clear emboss the image after stamping it twice across the landscape orientation of an A2 card. I decided to color in a night time sky with Distress Inks in Chipped Sapphire and Black Soot. I added a few white dots with a white gel pen for stars and then a simple Simon Says Stamp Sentiment from the Be Joyful set. The sentiment is heat embossed in gold. I fell in love with this card. It is so simple yet, I can't help but smile looking at it. Hubs promptly requested it be "his" card for the season. So, I gathered supplies, cut card stock and stamped, embossed and inked for much of the night into the wee hours recreating this card for him to mail out his Christmas greetings. 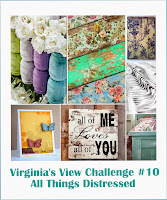 I am entering it in Virginia's View Challenge #10 - All Things Distressed. The challenge is open til the 17th.